18 • ROCK products • July 2018 www.rockproducts.com FRAC SAND INSIDER Emerge Energy Services LP plans to expand its sand operations with a new mining and processing facility located in Kingfisher County, Okla. Superior Silica Sands, a unit of Emerge Energy, inked a 25-year lease deal for the mining rights to 600 acres, located around 60 miles northwest of Oklahoma City. It also agreed to buy 40 acres of land adjoining its leased acreages for the construction of wet and dry processing plants. Approximately 65 percent of the deposit consists of 100-mesh sand with the rest consisting of 40/70. The expansion project is estimated to cost the partnership $15 million, which will be arranged from cash on-hand and revolver availability. Notably, it has $75 million in cash and cash equivalents as of Mar 31, 2018. Meanwhile, Emerge Energy does not expect the project to impact this year's capital expenditure guidance, which is anticipated to lie in the range of $70-$90 million. The plant in Oklahoma is expected to have a capacity of 1.5 million tpy. Site construction was planned to commence last month, and production is antic- ipated to come online by the end of 2018. The leased acres near Oklahoma City are expected to contain reserves of 20 million tons. Superior Silica intends to employ its existing equipment for developing part of its planned dry plant. The site has a highway and railway nearby, which can ease the partner- ship's product-shipping worries. The partnership plans to address the strong demand for fine mesh products through the new plant. It is currently making deals with potential clients for the plant's capacity and expects to complete the process by the end of this year. "Once the plant begins production, we will have approximately 6.1 million tons per year of in-basin production Alpine Silica Announces Two New Projects Alpine Silica announced two new proj- ects in Van Horn, Texas, and Fay, Okla., further adding to its existing portfolio. The firm currently owns and operates one plant in the Permian basin, with production capacity of approximately three million tons of high-quality frac sand per year. Alpine Silica has secured nearly 51 mil- lion tons of reserves for the Oklahoma initiative and is estimating that the plant will produce over three million tons of premium frac sand per year. The project in Fay, Okla., is expected to break ground within the next 30 days with construction lasting six months by an affiliated construction group. The firm also confirmed plans for a frac sand plant in Van Horn, Texas, which is estimated to produce approximately 3 million tpy. Groundbreaking for this plant will take place in the coming months and a construction time of seven months is estimated. 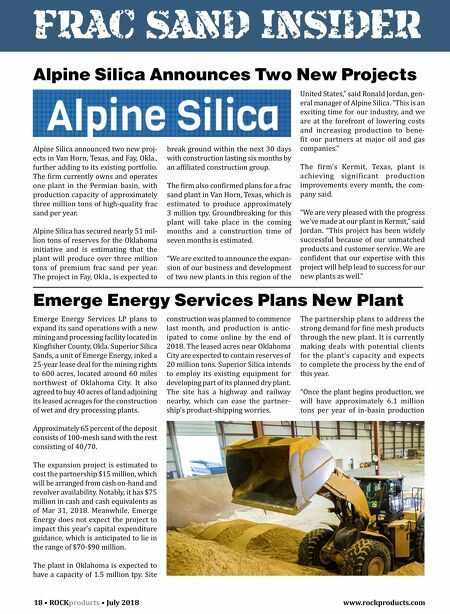 "We are excited to announce the expan- sion of our business and development of two new plants in this region of the Emerge Energy Services Plans New Plant United States," said Ronald Jordan, gen- eral manager of Alpine Silica. "This is an exciting time for our industry, and we are at the forefront of lowering costs and increasing production to bene- fit our partners at major oil and gas companies." 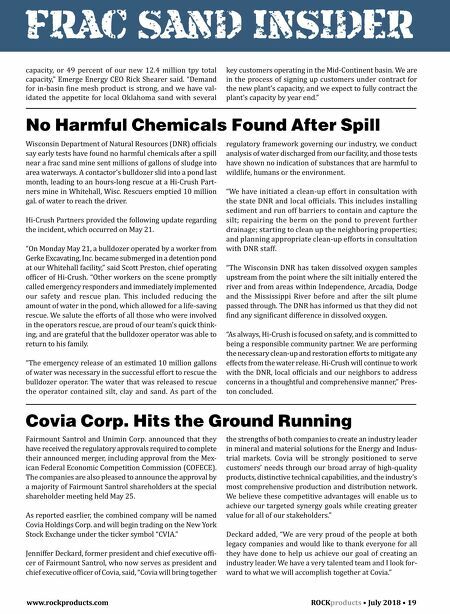 The firm's Kermit, Texas, plant is achieving significant production improvements every month, the com- pany said. "We are very pleased with the progress we've made at our plant in Kermit," said Jordan. "This project has been widely successful because of our unmatched products and customer service. We are confident that our expertise with this project will help lead to success for our new plants as well."